Tech enthusiasts were intrigued by a contest hosted by a South Korean sales agency, the object of which was to guess the Cinebench scores for the as of yet unreleased Ryzen 3600X and 3700X. However, the contest has now been cancelled after AMD was notified about it and the company presumably had a hand in shutting it down. 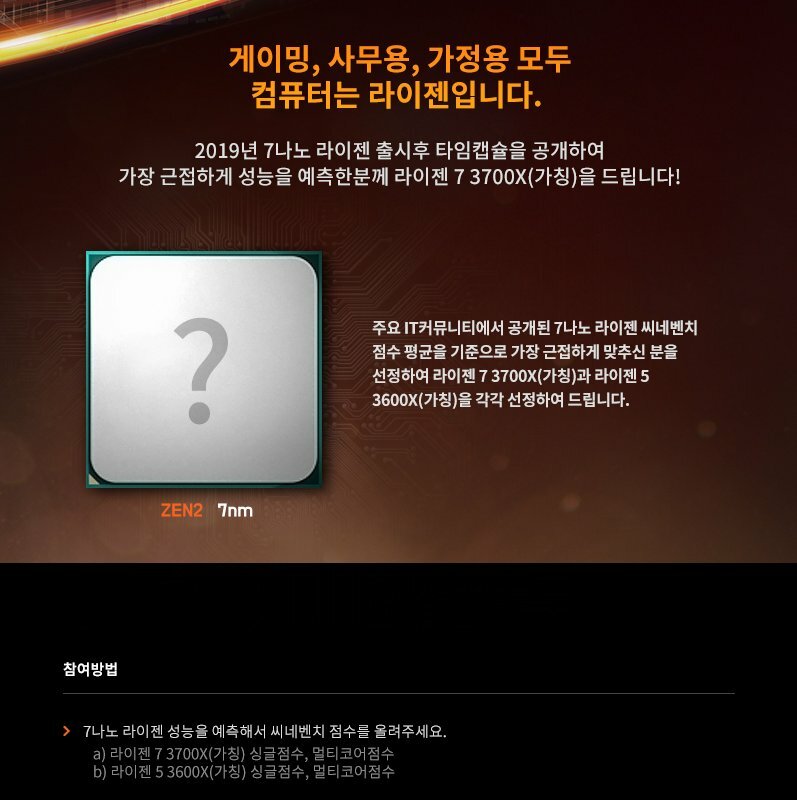 Just days after a potentially credible Ryzen 3000 series leak, a South Korean sales agency launched a contest about the upcoming Ryzen 3600X and 3700X, which have not even been announced yet. The object was to guess the Cinebench scores of each CPU by December 14th, and the prizes were said to be a 3600X and a 3700X; however, no date was given for when the prizes would be received. VideoCardz originally reported that the sales agency was not hired by AMD or affiliated with them, bringing into question the credibility of the contest. The Ryzen rumours are fake, pretty certain at this point. I've got info off the record so I can't released [sic] it, but yeah people are going to be upset when they really shouldn't be... don't assume Ryzen will be anything like Rome. If Walton's statements are to be believed then the actual CPUs won't quite match the high expectations set by recent leaks but will nonetheless be exciting. Some may have thought this contest was proof that Ryzen 3000 would be launching at CES per the recent rumors, but now that the contest has been pulled, it is questionable whether or not this sales agency was aware of either the Cinebench scores or the release date(s) for these two CPUs.